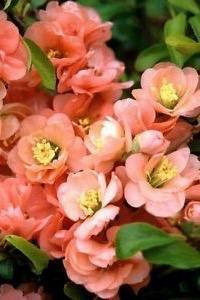 Compact habit with an abundance of semi double peach flowers on slightly thorny deciduous stems, March to May. Greenish yellow quinces in the autumn. Sun or shade.1.2m tall. Happy trained against a wall or fence.